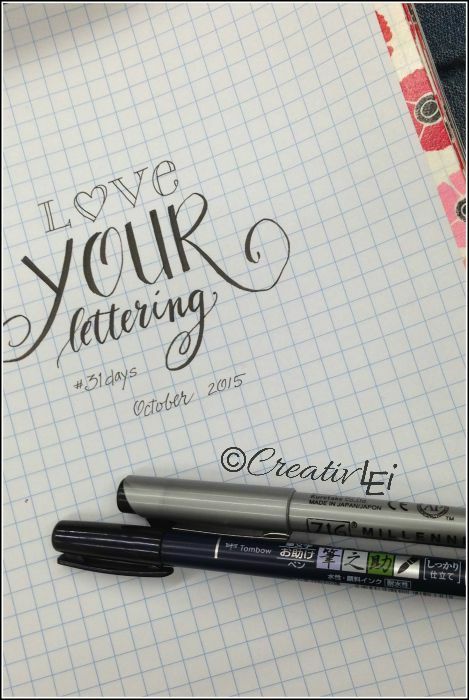 Let’s begin to love our lettering and improve our penmanship! 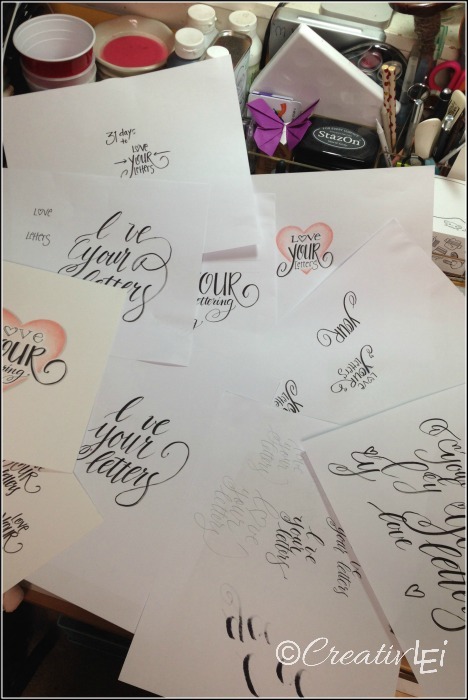 Is Love Your Lettering for Me? 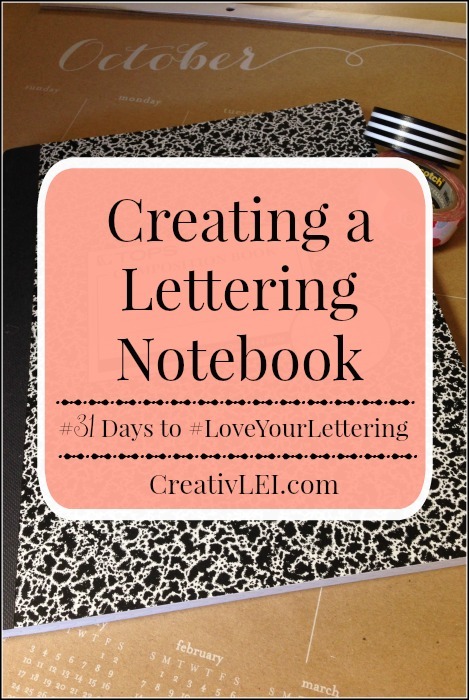 #Write31Days is about getting into a habit of consistency. If you’ve known me for any length of time, you know that consistency is my greatest challenge. I’m great at ideas, really good at starting things, excellent at building passion… not so good at the complete follow-through. Some of the links in this post are affiliate links. My full disclosure statement can be read here. This month is about building habits. 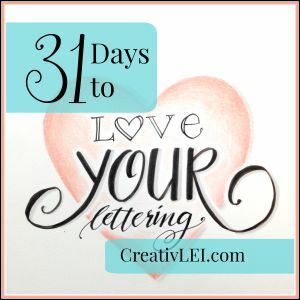 For you all, I want to show you that with just a little bit of time each day, you can build your lettering skills and learn to #LoveYourLettering. Grow your confidence to hand-write daily! For me, this month is about finishing something I start and consistently posting on the blog (which in the past has been feast or famine). Now, some of you who are already lettering fans might be chomping at the bit to dive right into intense exercises. This month is not going to be like that. In order to complete this month successfully, I’m going to break it up into very manageable pieces and start by laying a simple foundation. This series can certainly be considered an introductory course. Each new assignment should only take you 10-15 minutes. I wanted this instruction to be comfortable for everyone to try! Putting together your practice notebook. I’m using a quad-ruled composition book. I’m a lefty, I LOVE composition books. If you prefer to use a binder, I’ll still recommend using graph paper. The grid will help you with spacing and orientation for all of the styles we’ll be playing with this month. 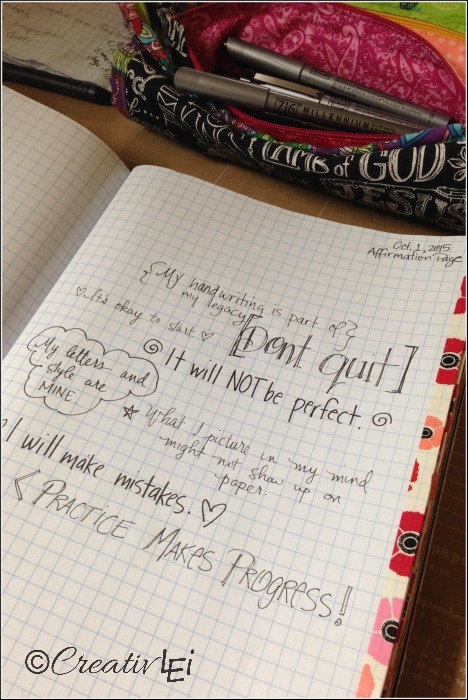 If you are able to invest a little more in starting your lettering journey, I recommend the DotPad from Rhodia. The paper is thicker and very smooth, which helps cut down some of the wear and tear of your pens. There is no need to tape two sheets together, because bleed-through is minimal until we play with watercolor in week 4. To prevent bleed-through when using markers, I suggest using washi tape to adhere two sheets for each page. In 2012 while taking the online Letter Love class from Joanne Sharpe, I followed her technique and used a glue stick and brayer to glue two sheets together. Her idea is brilliant to prevent bleed through, since there’s not much getting through two sheets of paper and a layer of glue! For me, this took longer and I was prone to getting bubbles and creases, which are not fun. Using the washi tape also leaves us the possibility for creating pockets pages to store clippings or print outs we’ll use as inspiration, as well as being able to slip in a guide sheet when needed. If you’re not yet comfortable writing out a decorative title page leave it blank until the end of this series, or print out the one I created and add it in with some washi tape. I didn’t leave any pages for a table of contents, but you can if you’d like. Maybe it seems silly, but you need to give yourself permission to enjoy this process. Free yourself from the expectation of perfection and mastery. This month isn’t about walking away making letters that look like mine, it’s about learning the foundations of penmanship and building our skills and confidence to grow our own handwriting style. On my affirmation page I started writing phrases that I need to remind myself of when I’m creating lettering pieces. There’s room for me to add to this throughout the month if I start to get in a rut, or add doodles when I need to warm up my hands. Just in case you’re already feeling overwhelmed or think you can’t do this… I don’t always make perfect lettering pieces. This is what my desk looked like while I tried to create the logo for this series. I knew in my mind’s eye how I wanted it to look, but getting that on to the paper took a LOT of tries. Keep at it, commit to try each day. It will be worth it. Washi tape your notebook pages if desired (functional and pretty). Add your title page (or leave it blank if you want to wait until the end of the month). Check in in our Facebook Group to share some of your affirmations. « Win an iPad Mini! Hi, where did you purchase the calendar on your desk? Hi, Cindy. My desk calendar is by Sugar Paper and was purchased at Target at the start of the year. I’m hoping they release them again for 2016! I am much better at copying than seeing in my head. So mine will look a lot like yours. Will you please post what pens you are using each day also please? Excited about this, and appreciate it so very much!! I will be talking about which pens I use in the Periscopes if I haven’t already included the info in the post. I’m a copycat too Sandra! That’s why Pinterest is so great! I’m very excited! I am a complete beginner, so the fact that you are taking it slow and that this is an intro course is perfect, for me at least. I love that you are focusing on consistency. That is my word for 2015 and while I have been pretty good at keeping up with what I wanted to, as the year has worn on, so has my focus. Thanks, Sherrie. This really is a fun challenge for me. Hoping to give you all lots of useful info without completely overwhelming you! Favorite pens; where to purchase?? I imagine different for correspondence vs. notes to kids, etc..
Hi Bridget. There is a list of the pens I’ll be using for this series on this post. I’ll talk about which pen I’m using in each new post. Towards the end of the month I’ll give a desk tour of some of my favorite things. 😉 Thanks for joining in! Awesome. I’ll definitely be adding the scopes to these posts, so no one will miss anything. I accidentally bout a 5×5 grid notebook. Will this still work or will the squares be to small? Thanks so much, Kristy. I hope I’m making Mrs. Gutterman, Mrs. Romano, and Mrs. Lonergan proud. What time is the periscope class tonight? I don’t have a set time, it’s likely to be around 10:30(EST), once the kids are in bed! I ordered the grid composition book on Amazon, but was sent a wide ruled book instead. So, I went to Office Depot to see what they might have and they had two sizes of composition books and an 8 1/2×11 spiral all with grid paper and all at a fraction of the cost of the one I ordered on Amazon. I thought those who are on a tight budget might appreciate the more affordable option. Ack! I’m sorry the one from Amazon was incorrect. That’s frustrating! Glad you were able to find something locally. I found some grid composition books at Walmart for $.97, the covers were a tad thinner, but the grid was good. I did it! I’m soooo loving this. What time will your Periscopes be held? Most nights they’ll be around 10:30 (after the kids are tucked into bed). Tonight might be a little earlier because all the excitement of today has me crashing hard! Hi Lisa, you mentioned that Pepper showed how to make tabs from Washi Tape. Please can you give me her contact details. 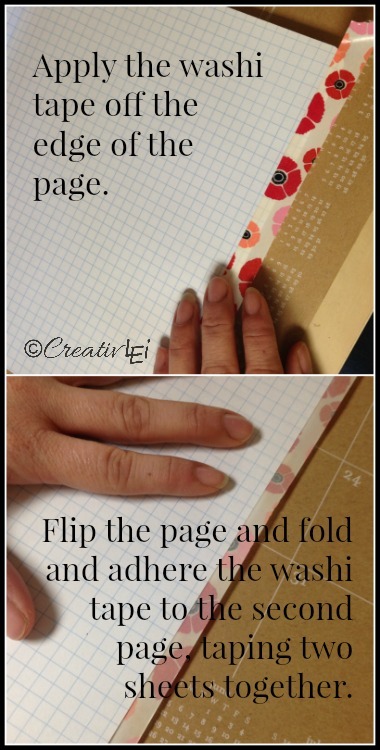 I need to make tabs for my Bible Journaling and this sounds very interesting indeed. You are soooo sweet for giving me a shout out! Thank you so much! Carving out time today to work on my lettering. Thank you, Lisa, for putting this together for us. So happy to have connected with you!!! I received Day 1 and 2 but didn’t receive the Day 3 email with the link. Is it possible to resend to me? You are so generous to share your talent and time with all of us. Thank you! This is just wonderful! Question my 14 yr old daughter and I have, do you have instructions on how to apply the duct tape to the composition notebooks?…We tried last night and oh my, what a mess, lets just say there are quite a few creases. The duck tape can be a little tricky. Check around you locally to see if you can find sheets of duck tape. I haven’t looked recently, but in the past I found them at a Super Walmart. They are just a little bigger than a composition book, so they give good coverage, and then you could just add a contrasting color to the binded edge. Thanks, we found them last night. Just found this site – Thank you for keeping it up – I would not have had time in Oct But January is my slower month and I can hopefully get through it – Glad I can work at my own pace – I am not a everyday girl – I am a my own pace girl!! I’m so glad you’ve found me! Welcome. I do hope you enjoy going through the lessons, if you have any questions, I’m always around to help! I signed up for Jon Acuff’s 30 days of hustle. Your class in on my 30 day hustle list. I have my pages washi taped and I’m ready to go. This might seem silly, but is there a way to sign up and have the classes emailed to me or was that only with your original group? Thanks!!! I really appreciate you doing this class!! Thanks for joining me. Thank you for your question. You’re not the first to ask, I just need to figure out HOW to do that. Unfortunately, I can’t give a timeline for that possibility. I hope you’ll be able to use the index page to go through daily during your hustle challenge. Welcome! I was wondering your thoughts…..When I was in my early 30’s I started getting arthritis in my hands. I hold a pen differently because of not being able to get a full grip. Do you have any tips or advice? I guess I was wondering if anyone else ever mentioned this challenge. Some of the pens are very thin. That is challenging, Rene’. Have you tried adding a ergonomic grip to the pens you’re using? The only time I’ve experienced arthritis and carpal tunnel pain, was during pregnancies. I sometimes wore a compression glove, which helped a little. Mostly it meant spending shorter times working. 🙁 I do hope you’re able to find a way to continue your art. Thank you so much for sharing the tip about compression gloves. I’ve never heard of them. I ordered some on Amazon to give them a try. I’ll also try the ergonomic grip. I’m not sure why I’ve never used one before. It’s probably something that would be good for me on a daily basis. I’m so appreciative. I stopped painting and doing any artsy stuff for awhile…your class has been a blessing!!. I do hope that you’ll find some relief to continue your creativity! Omg I love this! Is there anyway to still do this challenge!? I know you won’t be doing live check ins like this, but I’d love to do this challenge!!! I just retired and am so happy I found you and your online class. I’d really like to add creative lettering to my weekly planning, instead of depending on stickers all the time. Calligraphy was a passion of mine a long time ago; however, got lost over the years. Some years ago I also took a brush lettering class with Suzy Ratto which was a lot of fun, but very different from your style. I just ordered the basic supplies on Amazon and am looking forward to getting started! Thank you so much for offering this! Hi Katie. Thank you o much for your encouraging words. They are a very humbling compliment to me. I do hope you have fun and take this bit of creativity into your planner pages. Fell upon your site through pinterest. So want to work through your series! I have wonderful teacher lettering… but I want to push and make them creative and pretty, along with personalizing it for ME! Is there a reason that you can’t just slide a sheet of paper behind the one you are working on instead of using all that washi tape? Ok… gotta go watch this first video!!!! Woot-woot!!!! I’m sure that would be fine, you’d still likely have a little bleed through that would prevent using the back of the sheet, but you could reserve the washi. I actually like the little flash of color the washi gives to a humble composition book. I do hope you have fun, however you decide to set up your workbook. I’m getting a late start…..I found you thanks to Humorous Homemaking’s Instagram and I’m finally getting my rear in gear and taking some time for myself! I’m hoping to get started on this TONIGHT, but what pens do I buy? I’m not seeing info on that. Hi Kristen, there is a list that explains some of the tools I recommend, but please don’t feel that it’s necessary to get them all. I’m currently running the live demos on Periscope for the month of March and each week, I’ll post a picture on instagram of the type of pen we’ll need in the coming week. The first week and a half any fine-line pen will do, a Pigma Micron, Zig Millennium, or Sharpie No-Bleed. Even a favorite ballpoint pen is fine.